jazz tunes and blues, rare qualities in a Latin artist specially at such a young age. Sometime in 1956 she was asked by prestigious band leader Roberto Inglez to join his group as a vocalist for a 3-week stint at the Waldorf Astoria in New York. Miss Bell and the band went over so well that they stayed for a whole year in the Big Apple where they also performed in various television shows including The Show of Shows hosted by Ed Sullivan. 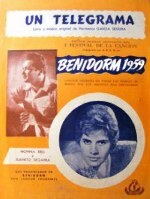 Original sheet music for "Un Telegrama"
From there they toured Europe but in Madrid the young vocalist decided to go solo after receiving an attractive offer from "Pasapoga", the best night club in town. Monna Bell at the Pasapoga was an outstanding success and she became a favorite of Spanish audiences. By 1958 she was recording for Hispavox a repertoire of romantic songs which included a cover of The Platters' "My Prayer" ("Rogar"), the theme song from the Hollywood film "Anastasia" and a Spanish version of "Woman in Love" ("Una Mujer Enamorada") from "Guys and Dolls." 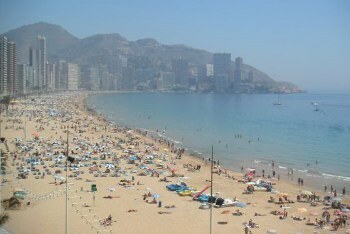 After finishing her contract in Madrid, Monna accepted a three month residency at a Barcelona music hall and later branched out to casinos in the resort cities of Palma de Mallorca, Marbella and San Sebastian. Finally she embarked on an European tour that took her action to Italy, Switzerland, Norway, Belgium and a glorious two-week sting at the "Dinarzade" in Paris. The following year Monna was invited to appear at the "First Spanish Song Festival" held at Benidorm, a beach resort in Alicante, Spain and her rendition of a jazzy novelty tune titled "Un Telegrama" made quite a sensation winning the top award in the competition. 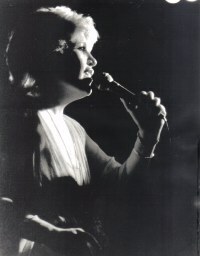 Her recording of "Un Telegrama" for Hispavox became an international hit both in Europe and Latin America making Monna Bell a top recording artist. 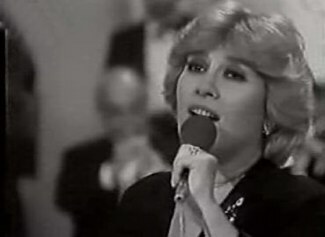 From then on it was hit after hit for the Chilean vocalist including "La Montaña," "Silencio Corazón," "Aun Te Sigo Amando," "Envidia," "Tómbola" and many others which spread her fame all over the world. She recorded with orchestras led by top musicians and arrangers such as Augusto Algueró Jr., Gregorio García Segura and Bebo Valdés. Riding the crest of an enormous popularity Monna Bell combined recording activities with live performances and television work both in Europe and America. 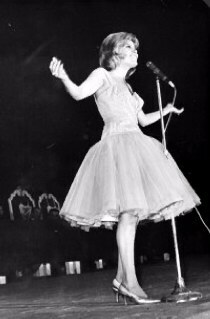 She captivated audiences everywhere with her youthful beauty and the freshness of her singing style while both fans and media alike noted the elegant wardrobe which added quite a bit of glamour to her charismatic stage presence. Between 1962 and 1964 Mexican film producers featured her in three films just to take advantage of her impact as a singer. Around this time she settled in Mexico and married cinematographer Alex Phillips Jr. The marriage did not last long but it produced a daughter, Jennifer, and a son, Alex III who is following on his mother's footsteps as a dynamic rock singer. 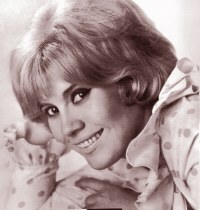 Monna's reputation as a hit maker followed her for many years and in 1968 she left the Hispavox label and signed with Mexico's Musart. However, the Musart sessions relied heavily on Spanish covers of American and British hits and although these assured her air play on Spanish language radio stations everywhere, the excitement of the first years was gone. In the 1970s she left Musart and signed with Orfeon, reportedly the worst record label in the world, where mediocre material, bad arrangements and worse production values sabotaged her career. Not even the dismal 1977 disco-version of her "Un Telegrama" mega-hit could revive the popularity of one of the most gifted songbirds in Latin music history. Monna...live! A delight for the ears and for the eyes.. There were also rumors of blacklisting by Televisa, a monopoly which, at that time, extended its influence on Mexican television, radio, recording, night clubs, printed press, etc. In the 1980s it seemed her career had run out of steam and Miss Bell was reported as "living happily in retirement enjoying the fruits of her labors". She was quickly forgotten by both the public and the music industry ignoring the facts that she had one of the greatest voices of the century and was a true musical innovator who had served as inspiration to a whole new generation of vocalists and songwriters. Among these was the popular Mexican singer and composer Juan Gabriel who tried to remedy the situation by luring Miss Bell out of retirement to appear as a guest star in some of his shows, both in Latin countries and in the United States. He even built a guest villa for Monna in his huge living compound in New Mexico so that she could vacation there whenever she felt like it. The relationship became an enduring friendship and offered the promise of a grand return for Monna Bell but it never happened. 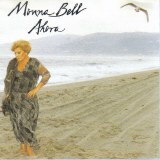 In 1993 Miss Bell recorded for Sony "Monna Bell Ahora," an album composed and produced by Juan Gabriel which went into oblivion as soon as it was released. Juan Gabriel blamed Sony for failing to promote the album properly but critics pointed out that the selection of songs was the main culprit in this debacle. One critic wrote: "Miss Bell's voice is as great as ever and her interpretation retains the genius that made her a legendary vocalist but there's not much she, or anyone else, can do with this boring material." After this professional disappointment, Miss Bell went back to her peaceful retirement without any regrets and dedicated much of her time to her family and socializing with a few intimate friends. She traveled often between Mexico, a vacation home in Pompano Beach, Florida and "her" New Mexico villa. She sang only on special occasions like at the 1996 tribute to her compatriot, the also legendary crooner Lucho Gatica, which was taped live in Miami and broadcasted worldwide by HBO Latin. That glorious night she shared the stage with Julio Iglesias, Celia Cruz, Olga Guillot and Juan Gabriel and received a standing ovation for her performance. 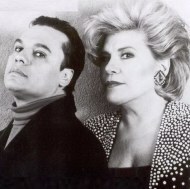 Juan Gabriel and his muse.  Bell’s artistic legacy since neither EMI-Hispavox in Spain nor Musart in Mexico seemed interested in releasing her recording output. The situation changed somewhat in the 2000s when Ramalama, a Spanish record label specializing in historical recordings, released two CD sets of Monna’s Hispavox recordings, rescuing a hundred of her greatest songs from oblivion. However the fact remains that record executives from the major labels seem totally ignorant of Monna Bell's place in Latin music history and consequently have no clue on how to market her product properly compromising a possible rediscovery by music fans and radio disc-jockeys. The hopes for a true artistic return vanished on April 21, 2008. While recovering from a successful colon cancer surgery, Monna Bell died of cardiac arrest at a hospital in Tijuana.